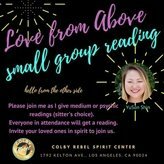 Everyone in this small group is guaranteed either a psychic or medium reading by YuSon Shin, psychic, medium and healer. It is an honor to connect you with your loved ones in spirit and give you evidence to show that they are with you always. Or to provide you with clarity to get you supercharged and unstoppable in your life path. Fun-filled evening in an intimate setting.